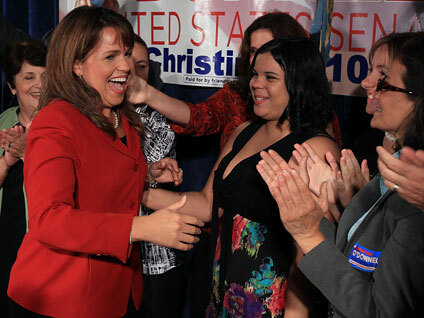 Delaware's Republican Senate candidate Christine O'Donnell may have lost the Wiccan vote. O'Donnell's decade-old remarks about having "dabbled into witchcraft," which resurfaced on Friday, were ill-informed and disappointing, some in the pagan community have said. "Any political candidate that is going to equate witchcraft with Satanism is ill informed and is not likely to get the support of people involved in nature religion," Reverend Selena Fox, the High Priestess & Senior Minister of the Circle Sanctuary, told the Huffington Post. Her non-profit organization is dedicated to promoting paganism and nature spirituality. Liberal pundit Bill Mahrer on Friday released a video clip from 1999 of O'Donnell talking about her foray into witchcraft in an appearance on his television show "Politically Incorrect." Over the weekend, O'Donnell brushed off the remarks, asking at an event on Sunday, "How many of you didn't hang out with questionable folks in high school?" Fox said that O'Donnell's jokes are defaming Wiccans. "Whether she intends to do that or not as a way to try and get herself out of this political problem she has created for herself, the fact is America really needs to be a place where you can celebrate diversity and practice your religion without getting ridiculed or defamed," she said. Sylvia T. Webb, first officer of the non-profit organization Covenant of the Goddess, told ABC News that O'Donnell's remarks were "bizarre" and contribute to the public's misunderstanding of the religion. For instance, O'Donnell said in her 1999 remarks that she went on a date at a Satanic altar as part of her experience with witchcraft. "It's very hard to worship something you do not believe in and Satan is a Christian concept," Webb said. "Wiccans don't have Satanic altars." While O'Donnell has attempted to downplay the remarks, some Republicans have said she would be wise to explain them to voters.